Beyond Certification: How Can Sustainability be Achieved in the Cocoa Sector? Make a sustainable cocoa sector achievable by joining forces. 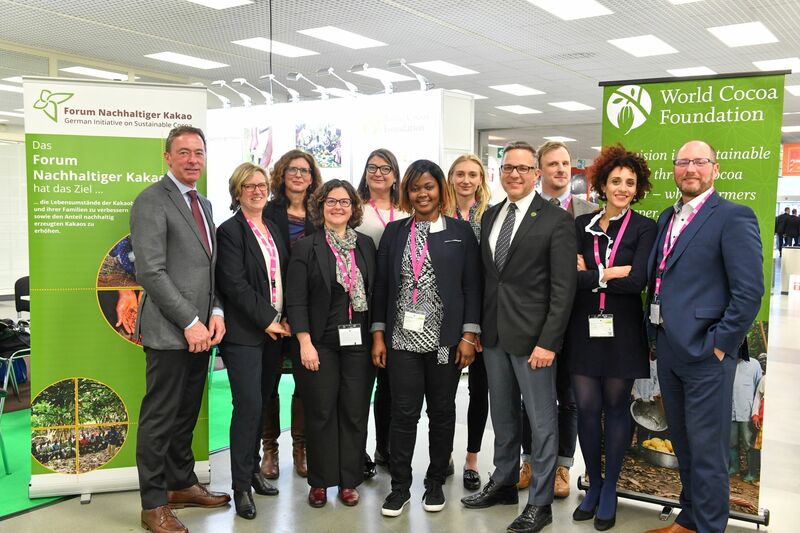 On invitation of the German Initiative on Sustainable Cocoa (GISCO) and the World Cocoa Foundation (WCF) this topic was discussed (from left to right): Wolf Kropp-Büttner, Beate Weiskopf (both GISCO), Heike Henn (BMZ), Karin Kreider (ISEAL), Cathy Pieters (Mondelez), Aminata Bamba (ECOOKIM), Rachel Munns (Tesco), Tim McCoy (WCF), Antonie Fountain (Voice), Noura Hanna (Rainforest Alliance), moderared by Lucas Simons (New Foresight). 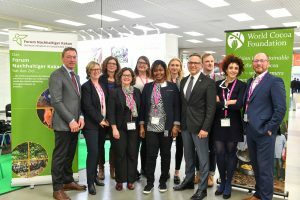 BERLIN/COLOGNE (January 31, 2018) – Different parties have rarely been as unified in their objective as it was the case in the joint event of the German Initiative on Sustainable Cocoa (GISCO) and the World Cocoa Foundation (WCF) on the opening day of ISM, the international fair for sweets and snacks in Cologne. Representatives from the chocolate and cocoa industry, grocery retail, non- governmental organizations, from the German government and producer organizations from Côte d’Ivoire came together to discuss ways to achieve more progress in addressing key challenges confronting the global cocoa sector, including farmer poverty, climate change and deforestation. The lively debate was initiated by the recognition that certification, although an important element of sustainability, cannot fully tackle the complex challenges. Furthermore, only 22 percent of the cocoa globally traded is certified. This is not enough to realize the promised increasing effect on cocoa farmers’ incomes. Participants of the event agreed that the sector as a whole needs to be transformed for more sustainability. “With 57% sustainably sourced cocoa we already made good progress, but the farmers have to associate with each others to enforce their market power to realize better prices,” Dr. German Jeub from the Federal Ministry of Food and Agriculture emphasized in his introductory speech. A new vision for the cocoa sector is currently in progress. The World Cocoa Conference in April 2018, which will take place in Germany for the first time, offers a platform for further discussion. Wolf Kropp-Büttner, Chairman of the German Initiative on Sustainable Cocoa, called for transparency and exchange. “We need to clarify the right approaches and work together in the same direction to resolve the complex challenges. Better local governance is key. To achieve this, we need to cooperate closely with governments in producer countries.” Sustainably produced cocoa has already reached a share of 45% in the German market; it even amounts to 57% among the members of GISCO (as of 2016). Tim McCoy, Vice President for Member and External Relations at the World Cocoa Foundation (WCF), which co-hosted the event, said: “Real transformation depends on much more joint action and joint accountability.” CocoaAction, launched by WCF in 2013, aligns leading members of the global chocolate and cocoa industry around an agreed set of activities and a results framework to accelerate sustainability in farm productivity and community development. More recently, WCF has worked with a larger segment of the chocolate and cocoa industry and development partners to launch the Cocoa & Forests Initiative, which unveiled country-specific Frameworks for Action at COP23 in Bonn in November 2017. The governments of Cote d’Ivoire and Ghana helped design the Frameworks and are engaged with WCF in implementing the Initiative. Cathy Pieters from Mondelēz International also emphasized accountability for all actors—providing evidence and transparency for investments—as an important first step. Since 2012 Mondelēz International has set up its own sustainability program. With CocoaLife, it intends to invest 400 million USD (313 mio. EUR) until 2022 to improve living conditions of cocoa farmers. “The challenges in cocoa are too large and diverse to be solved by compliance alone. Real transformation is needed. We cannot grow our business on a weak value chain,” Pieters said. Karin Kreider from the ISEAL Alliance highlighted the various positive effects that certification can achieve. “We need innovations to make progress, within certification systems and to meet the challenges of a rapidly changing environment. And we need to literally push boundaries: We could consider geographical certification, or take jurisdictional approaches,” Kreider said. One example she mentioned is the Global Living Wage Coalition, a joint initiative of six standards systems, including Rainforest Alliance and Fairtrade. The long term goal and shared mission of Global Living Wage Coalition members is to see improvements in workers’ conditions, including wage levels, in the farms, factories and supply chains participating in their systems. Aminata Bamba, a representative of the cooperative ECOOKIM, in which 13,000 farmers in Côte d’Ivoire are organized, illustrated the importance of promoting entrepreneurial spirit among farmers. “Additional sources of income, such as the cultivation of food crops, reduce dependence on cocoa. Crises like the current cocoa price crisis can more easily be managed with diversified sources of income,” she explained. Small cultivation areas of only two hectares make it difficult to achieve a good standard of living. Noura Hanna from the Rainforest Alliance views partnerships with governments of both, producers and consumer countries, as an important instrument beyond certification. “Because of the scale provided by our merger of Rainforest Alliance and UTZ, we are now even better placed to help catalyze change. But no single actor or single system can solve the remaining challenges in isolation. Collaboration with governments and global platforms such as WCF and GISCO will be key to bring farmers voices to the forefront and to make the cocoa sector more sustainable, more rapidly,” Hanna said. Consumers stand at the end of this supply chain. Rachel Munns from Tesco, a British grocery retail chain, said: “At Tesco, we collaborate with a number of partners to deliver sustainable and affordable cocoa. Independent certification adds to the confidence we have in our sources and means customers feel reassured we are working responsibly. We also have an important role to play beyond certification to tackle challenges in the cocoa sector—and we’re committed to working with our partners to achieve this.” Tesco have a public commitment that all the cocoa in their own-label products will be responsibly sourced, using a combination of sustainability programmes, by the end of 2018. An other important question was raised by Antonie Fountain. “Farmers are the only risk bearers of the huge price volatility in the cocoa sector and they also have the weakest economic position to start with,” he said. “Can voluntary standards really be sufficient, or do we need more legislation?” According to him, the market cannot regulate this on its own. In light of the severely dropped cocoa price and the question for living wages, the whole food sector needs to be transformed, Fountain said. “I am impressed by the willingness and the sincere interest of all those involved, the speakers and the other participants, to create a fair and sustainable sector,” Heike Henn, from the Federal Ministry for Economic Cooperation and Development, concluded the discussion. The new Green Innovation Center for Cocoa in the Côte d’Ivoire will cooperate with important actors like WCF, private sector, civil society, local governments and farmer organizations to build a more sustainable sector. The Ministry for Economic Cooperation and Development works to completely transform the agricultural sector in developing countries. “Help us to ensure wealth and well-being for people in all countries,” Henn said to close her speech. GISCO and WCF are in close exchange and seek to join their forces and to support each other’s work. In the European context, GISCO announced its closer cooperation with the newly founded Swiss Platform for Sustainable Cocoa by signing a Memorandum of Understanding in January 2018.